In his Gettysburg Address, President Abraham Lincoln acknowledged that America was "conceived in Liberty." 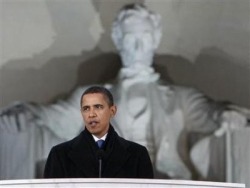 Lincoln could never imagine voters supporting a president aborting Liberty to rebirth America conceived in Government. Obamacare is the equivalent of America born-again conceived in government. In the classic movie, "Planet of the Apes," Charleston Heston crash landed his spacecraft on a strange planet where apes were superior to humans. Shocked to realize that the strange planet was really earth several years into the future, Heston cried out in devastation, pain and anger at man, "Damn you! Damn you all to hell! You blew it up!" I believe President Lincoln would have a similar reaction, returning to America today. Devastated and disbelieving, Lincoln would ask, how did this happen? Decades ago, the Left successfully banned prayer in public schools which taught children that God and traditional morality were no longer welcome. Seizing the moment, like locust, socialist/progressives swarmed into schools indoctrinating our kids with their "new morality" — anti-Christian, anti-parent, anti-American and pro-homosexuality. These Leftist's agenda included branding Christianity fanatical while teaching respect and sympathy for Islam. Patriotism was redefined as rude to foreigners — Capitalism is immoral and selfish — opposing gay marriage is prejudice, equal to the black civil rights movement. While sipping our coffees at Starbucks (President Lincoln unbelieving the price of our Javas), I continue explaining to the stunned former U.S. president how we got to where we are in America today. Mr President, you won't believe this, but individual liberty and achievement are attacked at every turn on TV, in movies and the media. It is a box on the wall projecting images — never mind, I'll explain later. The Oprah Winfrey TV show along with a media dominated by liberals and the Democratic Party contributed to creating the mindset in voters that everyone is a victim of someone or something. Their usual imaginary villains are rich racist male Caucasians. The Left has created a touchy-feely culture, in which self-esteem and hurt feelings now trump common sense and individual responsibility. Thanks to your efforts, Mr Lincoln, America elected its first black president. The bad news is he trashes the Constitution, whenever, which is often, it interferes with implementing his Socialistic agenda. http://www.youtube.com/watch?v=3dKsj6dGShI Sadly, dumb-down public-school-educated feelings-trump-law voters see no problem with government usurping un-Constitutional power. Ben Franklin said, "Those who would give up essential Liberty, to purchase a little temporary Safety, deserve neither Liberty nor Safety." Because feelings now trump law, in the name of safety and compassion, government control/regulations have been allowed to become tyrannical. Federal regulations have quadrupled under Obama, stifling business. http://blog.heritage.org/2012/10/17/debate-analysis-did-regulation-quadruple-under-obama-the-numbers-say-yes/ A tsunami of new Obama regulations are on the horizon. http://www.foxnews.com/politics/2012/12/22/obama-releases-first-part-new-regulatory-agenda-drawing-criticism-from/ Meanwhile, idiot Obama voters believe the lack of jobs is President Bush's fault. I guess you're right sir (President Lincoln), calling voters idiots is probably not the best thing. But, the catastrophic consequences of their stupidity is breathtaking. Here's a biggy Mr. Lincoln, the Second Amendment is soon to go the way of the dinosaur. Government, remarkably with voter approval, is in the progress of disarming Americans. http://petersantilli.com/2010/06/07/bilderberg-blesses-obama-move-towards-disarming-americans/ Thus, leaving citizens at the mercy of criminals and government to do with us as they please. Where is our country headed when you consider that Adolf Hilter also disarmed the people and used give-a-ways to seduce supporters? Mr President (Lincoln), it has been awesome hanging out with you. Sir, I know it looks really really bad right now. I share your tears for our country. I promise to keep fighting for the values and principles we both know are right and best for all Americans. I am chairman of a new organization called the Conservative Campaign Committee. https://secure.donationsafe.com/ccc Our ultimate goal is to convince a majority to reject Obama's born-again America and return back to your America — conceived in Liberty.